As you may already know we used to really struggle with Beau and his Pica, but I’m happy to let you know that Beau hasn’t chewed on anything abnormal in months! 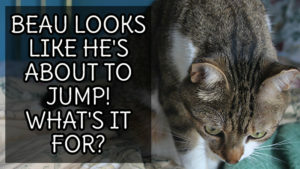 Let me give you a rundown on Pica, how you can spot it & what you can do to prevent your little one from eating your clothes and other foreign objects that may cause problems with the health of your kitty! Pica is the urge to eat non-food objects and is more common in cats than you would expect. Cats with Pica tend to be most interested in soft materials such as wool, but have been known to eat materials such as plastic and even litter. How can I tell my cat has Pica? Well with Beau it was obvious almost the second we got him. The first week I had Beau I noticed he would try to eat his litter, and I immediately started researching why he may be doing this and if it was going to be hazardous to his body. Luckily, the litter we were using was all natural, and although it was a priority to get him to stop eating his litter we were reassured that we wouldn’t face major consequences. It’s not always clear that your little one is eating foreign objects, for example, Beau started eating tissue papers and the tassels off of our carpets (the carpets looked almost the same after he gave them a little trim) so I would highly recommend that owners look into their little one’s poop. It’s very obvious that your cat has eaten a foreign object as it will most commonly be visible (as your cat won’t be able to digest it.) Most cats with Pica will also “wool suckle” which is something Beau still tries to do and is believed to be the case for cats who have the urge to nurse since they were weaned too soon. Are there any medical issues related to Pica? Not to worry you, there can be some medical issues related to Pica. And before you read this next part, I recommend getting a thorough checkup with your vet, because chances are it’s related to boredom, stress, anxiety or just a learned behaviour. Surprisingly, the amount of cats with diabetes is currently 0.5%-2%, but vets assume this is because many cats go undiagnosed or don’t have routine checkups. Diabetes is most commonly caused by the food you feed your little one and doesn’t always correlate with energy levels and the weight of your cat. I would recommend staying away from most foods with fillers such as Meow-Mix and Cat Chow and look for higher grade food such as Now Fresh, Weruva and Vet Specific Food like Science Diet or Royal Canin (if your little one has other health issues.) Remember, feeding your little one a more expensive food will mean fewer vet visits (aka fewer bills), a better life expectancy, a healthier life, and a happier and stress-free pet owner. Do your research on foods! Ask questions to representatives. A lot of companies are transparent about their foods such as Primal or Natural Balance and make sure you think of it like this: Would I eat something labelled “insert ingredient name here” or do I know what “ingredient name is?” Research is your best friend, and a vet will always be able to explain why one food is better than another. This one is scary, and again please go see a vet before you freak out and think your little one has a brain tumour. Brain tumours are fairly easy to spot. The most common sign of a brain tumour is a seizure (although they most commonly happen at the age of 5.) Other signs of brain tumours include a change in behaviour, head pressing, sensitivity to being touched in certain areas (such as the neck), bumping into inanimate objects, vision problems, and uncoordinated movement. Cats have also been known to mew more frequently and may not purr as much. Again, Pica isn’t always related to brain tumours, but it’s good information to know in case you notice other habits changing. What are some non-medicals reasons for my cat’s Pica? Oftentimes cat’s aren’t stimulated as much as they need to be. 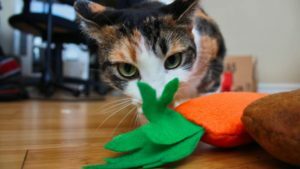 This can be easily solved by playing actively with your cat, or if your cat is the type to play by themselves, you may be in luck with some passive toy suggestions. Remember, your little one is so much smaller than you, so lots of noise can bother them. 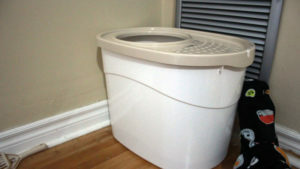 Make sure your little one has space for them to hide or “chill” when things get too loud. We built Beau a hut and a “man cave” for this reason. Playing soft piano music also does a great deal to help calm anxiety and stress. Actually, as soon as I found out Beau is very reactive to music, I started writing him my own music which I hope to share with you all once it’s ready! When we first got Beau he had a great amount of separation anxiety and his Pica would spark the most when we weren’t home or were asleep. When we’d get back we’d find towels, pillowcases, blankets and tissue papers eaten. This is when we started to take advantage of feeder toys. Leaving a bit of kibble for him to nibble on while we were gone, but making sure that he couldn’t swallow them quickly and letting him pace through the food throughout the day. Another tool vets use is called Feliway. I personally haven’t used Feliway because I’m still a bit sceptical, but it is meant to release the pheromone that mother’s produce to help calm kitties down. 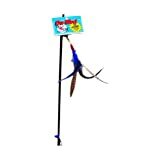 When Beau was in the Emergency they hooked him up with one of these bad boys, and they said he really enjoyed it, but since it wasn’t a first-hand experience I can’t confirm or deny. It’s always worth a shot, but I would definitely take a look at reviews before purchasing. It was a really big struggle to get Beau to eat wet food, but on days where he ate even 1.5 oz he didn’t seem to chew. Wet food may not be ideal for the teeth, but foreign objects in your kitty’s tummy is definitely the larger of the two evils. Beau was more interested in wet food with a higher fat content such as La Isla Bonita made by Weruva. Wet food is also a great way for you to supplement water and I even mix extra water into the food to make sure Beau gets his full intake for the day. 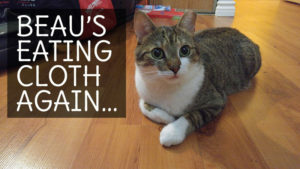 If your cat is prone to Urinary Tract Infections wet food is a great route to take or else you may be in for a nasty surgery, especially if they are male. I know, I know… I’m too busy or at work to feed my cat more than twice a day! Again, it’s not ideal, but I would highly recommend 4 feeding sessions. They don’t have to be spread out equally, but it does give your kitty less time to get hungry or worry that they aren’t going to get fed. This was one of the changes we made in Beau’s life that really got him to stop eating random things. There are also plenty timed automatic feeders you can purchase for a decent price. Remember, if you can get your cat to stop chewing on foreign objects, you’re gonna save more on vet bills AND the bills to replace the objects in your house. I have so many photos of toys Beau at the faces off of, and the 5-bed sheets he ate, and dozens of towels, clothes and cloth he ate. I’m so glad it’s all over now! 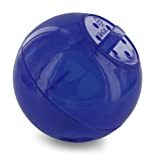 I’ll admit, I personally haven’t used any deterrent sprays with Beau because he doesn’t mind bitter tastes, but when I still worked at the pet store and I had customers come in saying that their little ones were still aggressively chewing and I recommended some really great deterrent sprays. I would always recommend deterrent sprays as your last resort since I’ve actually tasted a few of them on myself, and let me tell you… they’re not tasty and some made me want to hurl! The most aggressive one I’ve tried is Vet’s Best Bitter Cherry Spray, with Grannick’s Bitter Apple, Bitter Lemon Spray, and NaturVet Bitter Yuck! closely after. Off the bat, the most popular was Bitter Apple (for both cats and dogs) and I’d say for every 10 customers that came in with this problem 9 were happy with the results. Each little furball is going to have a different palate, so some of these sprays may not work with your little one. For example, Beau eats cranberries which is highly unusual for a cat, so you may have to test some different ones out. Let me know if any work for you and if you have any better ones to recommend! So Pet Parents, let me know what you did to try to help! What worked and what didn’t? Pica is such an odd thing to deal with, but it doesn’t mean that we can’t help each other out to find solutions! I have a 3 1/2 yr old Siberian cat who has serious pica. Jinga eats wool, fleece, bedding, pillows including stuffing, towels,clothing, plastic, and chews cords. Seems I’ve tried everything to try to solve the problem without success. He has been on Fluoxetine for almost a year and initially it seemed to help but this winter things have again been out of control.. Yes I know there is a boredom issue. I try to play with him as he doesn’t do well with entertaining himself but he loses interest fairly quickly and really only likes dabird and cat dancer. Food is 60% raw plus 40% quality wet with added water 3 times a day. No kibble other than a few treats most days in a hunt or chase game or treat puzzle. He has gained weight with the med so I don’t think the extra calories are good. There is also a stress issue with my other male cat who is a jealous lap buddy who can be a bully. I have Jinga s mama too and they are bonded and often lay together. So far he has not had a blockage (miracle) but it’s inevitable. Sometimes he throws up pieces of stuff he’s eaten or stops eating meals for a day or so. I live in fear of what’s next and I’ve spent so much money on this problem already.. It’s harder to manage play in a. household with 3 cats. Any ideas would be appreciated. Unfortunately, I don’t have much more advice than what I’ve said above. Unfortunately, Pica is one of those diseases that takes time and patience to figure out what’s going to work the best. Beau still gets spats of it every so often and even though in the past year (365 days, and not just the month of January), Beau has maybe eaten from 3 items. At the moment for us, it’s really focussing on the timing of his meals. As for the “bully cat”, does he ever both Jinga especially when eating? If that’s the case, you may want to find ways to make sure they are absolutely separated at feeding times. Pica can be worsened due to cats feeling like they have to eat quickly or else another cat will steal their food. Let me know if any of that helps you further. Hi , my Caprica have the same disease. We’ve been trying Amitriptyline in replacement of the Fluoxetine and for now it’s seem to work . I don’t know for you but when i’m at home she’s a normal cat with little cases of relapse . She have anxiety and emotional desorder . Since i’m on pregnancy leave she’s been really good on not eating everything she find. 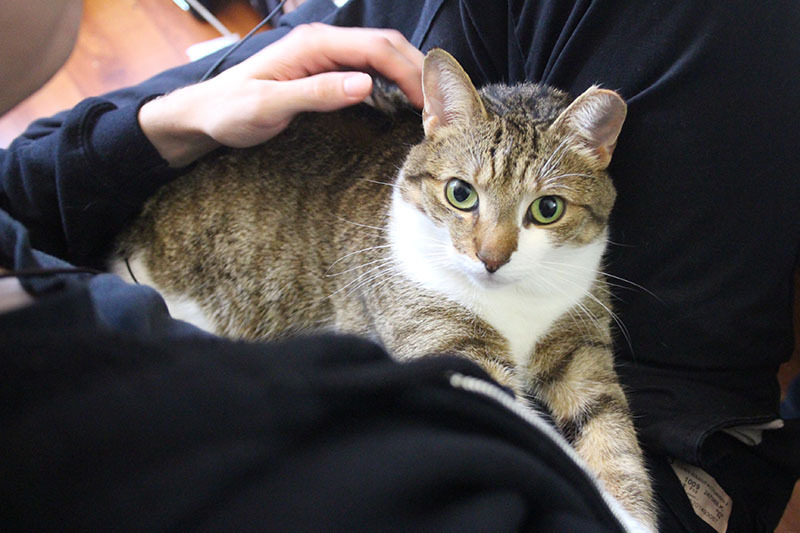 Give him a lot of time , of love , never empty bowl and a cat l food with a good amount of protein and fiber . That’s the only tips I can give you . Because I’m clueless like the two of you . Our cat Caprica have severe Pica disorder ; she like eating soft fabric . Like all of them ; sheets , pillowcases, clothing , shoelaces , socks and she have a soft spot for polar fleece . We are desperate. We tried like everything from a food with more fibers , more frequent meals , never empty bowl , Feliway,stomach relief tablets and Fluoxetine and lot of love because she crave it like crazy . She need a lot of attention because she suffers from anxiety and emotional separation disorder . She was so tiny when she arrive at the shelter and didn’t get to be with her mommy. We give her a second chance but we’re struggling a lot to make her feeling better. She’s the best cat we ever had but her condition is hard to deal with . We are hoping it will get better but we are loosing hope . Hello Emilie. I’m sorry to hear that Caprica is suffering from Pica. At this time, the only advice I have is what I’ve listed above and lots of patience. It took us a number of months to figure out how to control Beau’s want to chew on soft materials and sometimes it comes back for a few days, but it is much more under control than it was a few years ago. She has some kind of relapses from time to time , period where she hit a peak and go back to normal for a while. But it’s never for long . I’m pregnant and don’t how she will react when the baby arrive . Next week we’re starting a long terme treatment with Fluoxetine hoping it will help her dealing with all her mixed feelings . I have had a wool sucker…a wool/string eater, a cardboard chewer/biter, a cord destroyer (Minko), and Pipo is a plastic biter. My first kitty did not do those things as far as I could tell,,. And our second kitty was a plant eater, as was the third one. He destroyed a science project so badly that our boys had to start over, MOL! Suki once downed about a foot of yarn, brought home on a project from kindergarten art class…she took it off the fridge. She was able to spew it out after the vet gave me instructions…After that, no more wool/yarn was allowed to be accessible. Pipo’s fave is the shrink wrap or rings on six pacs…I always giggled at the cardboard biting, it was like a way for them to clean their teeth! And Pipo will bite bags that hold food and treats…even papers on my desk. He is such a rascal! Oh man, looks like you’ve had to deal with a lot of crazy chewing! Did you ever get a hang of everything with them? Walker is also a cardboard biter, I find it so odd that he’s one though, since Beau doesn’t care for cardboard at all! About all you can do is make sure they don’t have free access to the things you don’t want them chewing on…and constant ‘snoopervision’! Very interesting post. I have never had a cat with this issue. Wally likes to chew plastic. He usually doesn’t try to eat it, just chews on it and spits it out. It’s still not good, so we try to keep plastic things away from him. Found this post interesting. Can put it on both of my WordPress Sites And Google+? Question for you? I was wondering what you know and/or can tell me about a cat continuously itching and biting. You see My Daisy Mae does what I described. She has no fleas but for relief the vet gave her an antibiotic shot and steroid shot which gave her temporary relief for about a month but we are back to square 1. What are your thoughts? Is it just an allergy or possibly something more serious? It can definitely be an allergy or very dry skin. You may want to check it out with a dermatologist. I can’t think of something extremely serious it would be before seeing her, but usually, the more serious skin problems come with hair loss, hotspots, and lesions. I would try some coconut oil or even ingestible salmon oil/omega 3 & 6 fatty acids. Have you talked to your vet about the type of food you’re feeding her and tried switching it? Interesting post! When Chucky would chew on strings, or verical blind cords, or my pajama bottom ties, we just thought it was a ‘cat’ thing, although his sister Angel never did it. Once he ate a rope toy (swallowed whole!) and while we waited for him to pass it, or have surgery, we redoubled our efforts to keep anything stringy out of his reach. We feel that the intestinal damage done by that incident with the rope toy may have caused his constant constipation, and also led to his heart problems. Manny and Chili Bruce both lick fuzzy, fleecy things, but they don’t try to chew through any wand toy strings, nor my necklaces nor verical blind cords. I still keep my scarves (many with tassles and cords on the ends) hidden away. Glad that Beau has turned over a new leaf!